I can tell you even less about this fish than I could for S. grigorjewi. 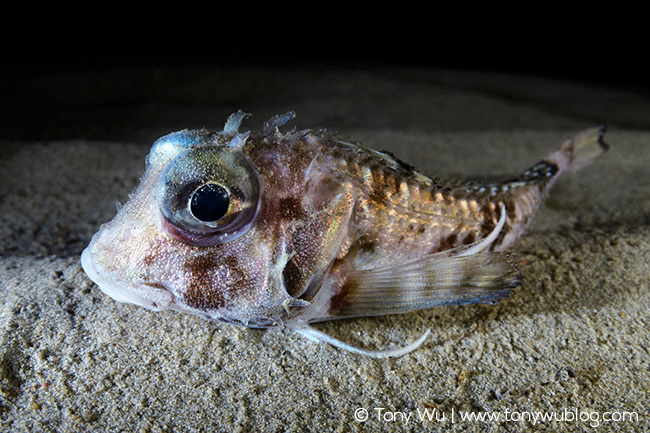 Marukawichthys ambulator is a deep-ocean sculpin, a member of the Ereuniidae family, about which we know almost nothing. To quote from Deep-Sea Fishes: Biology, Diversity, Ecology and Fisheries (Imants G. Priede, Cambridge University Press 2017, p.257), "This little-known family with three species is distinguished from typical sculpins of the family Cottidae by the presence of free pectoral fin rays similar to those in trigids. They probably live at a minimum depth of 500 m in the North West Pacific..."
Got it? Yeah, same here. I know this species lives deep and is rarely seen. This one was about 20cm in length. Beyond that, not much information. I do like its big eyes and somewhat manga-esque appearance though.